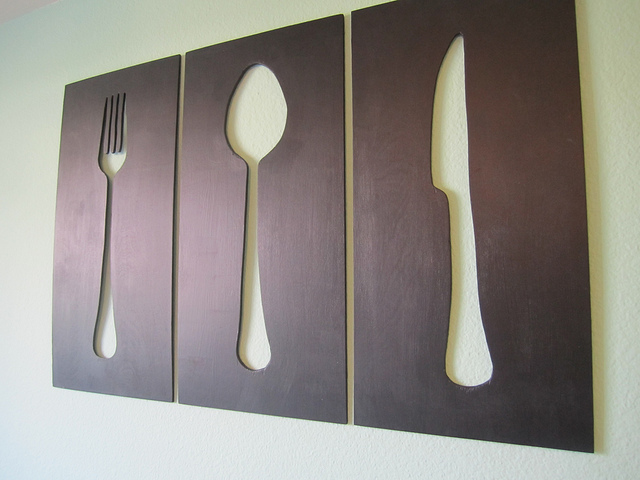 Love this utensil artwork for the dining room! And Leah from California Callahans only spent $8 to make them! She finished them with chalkboard paint, which I love. There's something about the simplicity and rawness of this lamp that is so appealing to me. 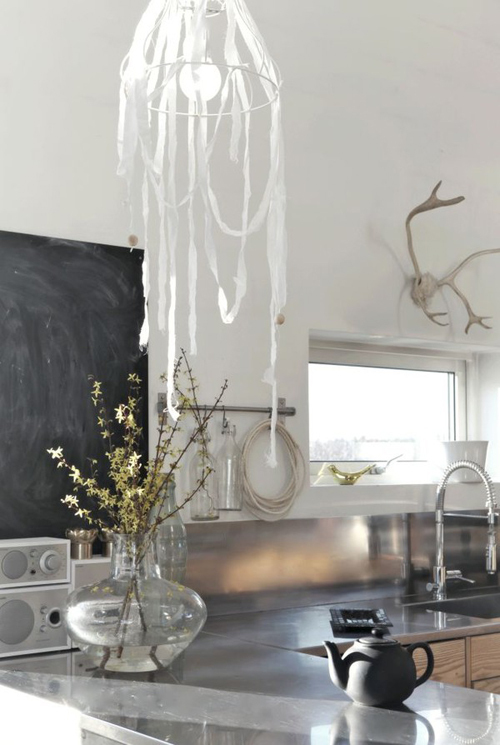 I spotted this via The Style Files (who picked it up from emmas designblogg), and it's made from a lamp shade, wood beads and strips of fabric from a rug. Pretty thrifty nifty! Okay...this project might actually turn me on to gift wrapping (historically it's not my favorite thing to do in the world). 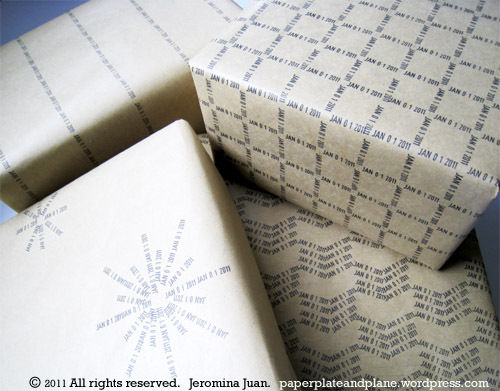 Jeromina from Paper, Plate and Plane came up with this project idea and used kraft paper, a date rubber stamp and an ink pad. She also points out the versatility of this idea: just change the date to the day of the occasion to make it personal to the giftee! Nice. I kinda love monograms (I'm currently collecting a ton of letter "S's to group together in our new home). 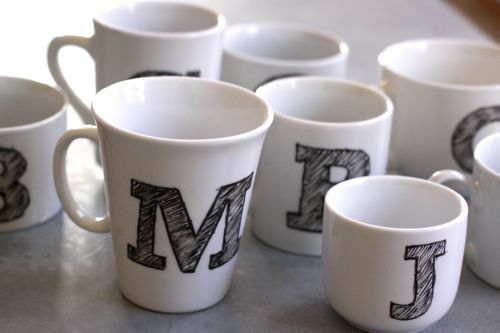 And these monogram mugs via Design Mom are cute, easy to make and a great gift idea (she stuffed the insides with the making for hot cocoa). 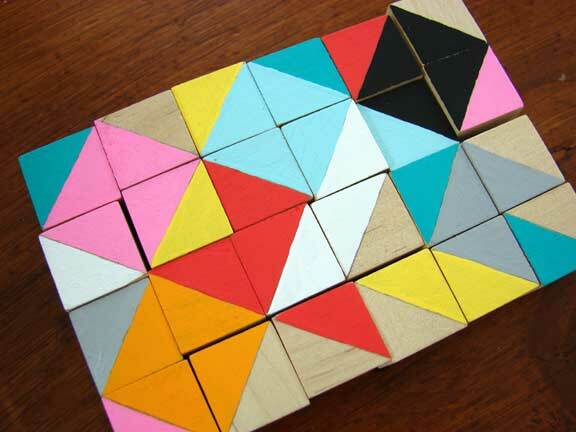 Last, and certainly the most colorful, are these geometric blocks via Aesthetic Outburst. She made them as part of her 20 in 20 idea (make 20 craft projects in 20 days, and then she's giving them away! ), and I think they'd be so fun to have out on the coffee table for guests to play with, or stacked on a shelf.